We love restaurant weeks, particularly Oakland Restaurant Week. First up for #ORW18 is Farley’s East. 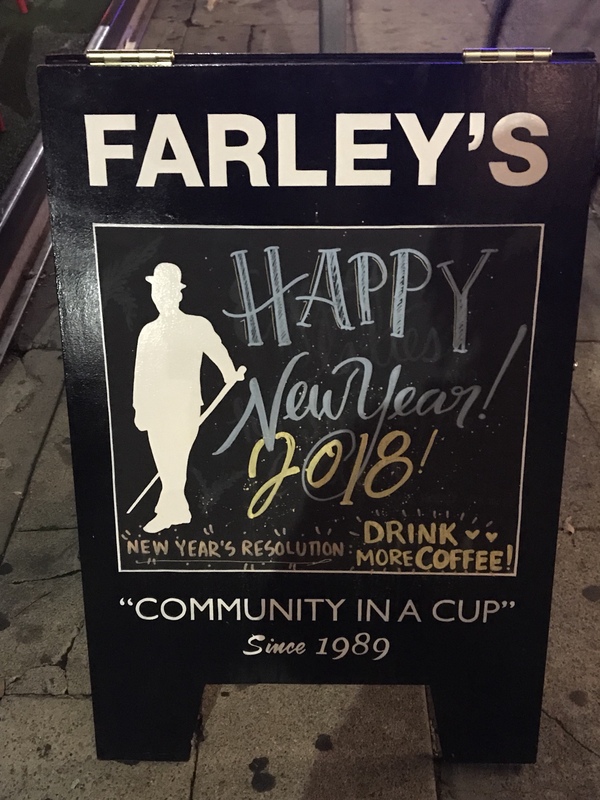 Farley’s is located in uptown Oakland on Grand and Broadway close to the 19th Street BART station. It’s open for breakfast, lunch, dinner and coffee and has wi fi. Tripadvisor ranked it #348 of 1,300 places to eat in Oakland. Their #ORW18 menu for $20 includes a choice of panini or salad, choice of cup of soup or chocolate chip sea salt cookie (Alan started us off with warm ones, baked in house, gooey and delicious, only think missing was the milk), choice of beer or glass of wine. Natalie had the grilled cheese with three cheeses, gruyere, mozzarella, and blue cheese, and green onions served on Acme bread. Kiki had a Grilled BLT with mozzarella, herbed aioli and mixed greens. We split the Farley’s Special Salad, Moroccan spiced carrot and chickpea with arugula, couscous, feta, mint, and Harissa dressing with chicken! Too much food, the salad with could have been a meal unto itself. Lots of leftovers. Great ambiance, outdoor seating, small, but there was eating upstairs too. They also feature a different non-profit every month and do a fundraiser. This month’s featured non-profit is PALS East Bay, a nonprofit animal welfare organization committed to helping East Bay pet owners who have fallen on hard times keep their pets. Thanks to Alan and Julia for taking our orders and to Chef Chris for the demo and allowing me in her kitchen. Thanks also to co-owners/spouses, Chris and Amy Hillyard, for arranging, hosting us, for the delicious food and the fundraising for non-profits.